Who does not want to travel in style? Although visitors usually differ from tourists by means of choosing less comfortable accommodations and investing in live experiences, once in a while it is not bad to spoil yourself, especially when visiting a great capital city like London. There are many central hotels and B&B options to choose from, but not all can pride with a 4 star rating. This is why we would strongly recommend you Hotel Russell London. This accommodation has literally become a British symbol. As it is located in Bloomsbury area you will enjoy a great view over the beautiful Russell Square and other Central London sights. In your free time, you can choose to spend the day in the cultural West End district. Visit the British Museum or take a walk in one of the Royal Parks. If you decide to travel to other boroughs, simply take one of the accessible and available means of public or private means of transport. In order to get a Heathrow to Hotel Russell London Transfer by rail there are two main options. First of all, you could take the Tube from Heathrow Terminals 1-2-3 (every 5 minutes), ending with a 3 minute walk. This journey lasts about 56 minutes in total. The second option involves a bus from Heathrow Central Bus Station (every 60 minutes) via Soho, Aldwych (every 5 minutes), followed by a short 1 minute walk. This trip lasts around 1 hour and 15 minutes. A Heathrow to Hotel Russell London Transfer by car can be done by taking the M4 motorway. Heathrow Airport is at a 19.5 miles distance from Hotel Russell London. This journey will take about 40 minutes, without including traffic. A Heathrow to Hotel Russell London Taxi Transfer with 247 Heathrow Airport Transfer is going to take about 57 minutes, including rush hour traffic. 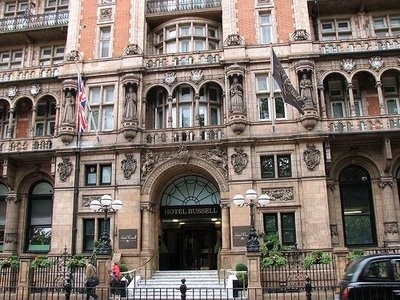 The price for a Heathrow to Hotel Russell London Taxi starts from 42 GBP.